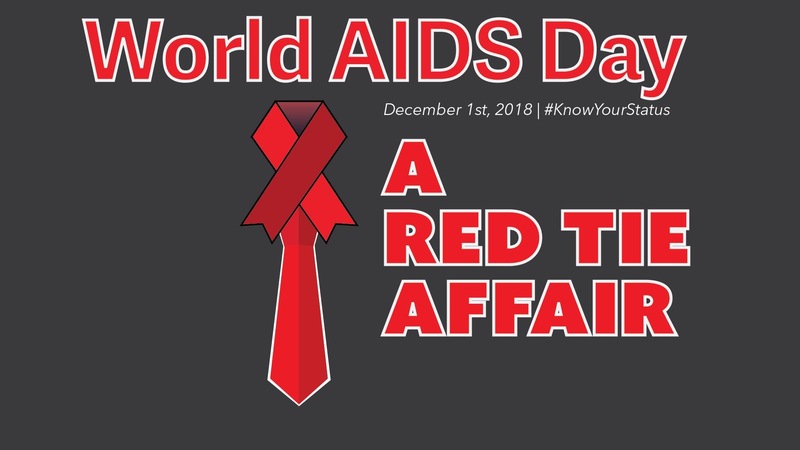 With a coalition of community partners, The Northern Nevada Outreach Team (NNOT) has put together a day of events for this Saturday – World AIDS Day, they are calling A Red Tie Affair. Creating events and participating are: The Biggest Little Rainbow Runners, OUR Center, Northern Nevada H.O.P.E.S., FacesNV, Sinful Entertainment, A.C.C.E.P.T., Washoe County Health District, The Silver Dollar Court, Latinx Pride New Generation, Nevada Division of Public and Behavioral Health and the Office of HIV/AIDS, University of Nevada, Reno Health Sciences. This year marks the 30th year for World AIDS Day to bring awareness about HIV/AIDS around the globe through the efforts of the United Nations and its World Health Organization. World AIDS Day is one of eight global public health campaigns that raise awareness in all United Nation member states. Reno’s awareness campaign has long been coordinated by NNOT and is one of the organizations major annual events. 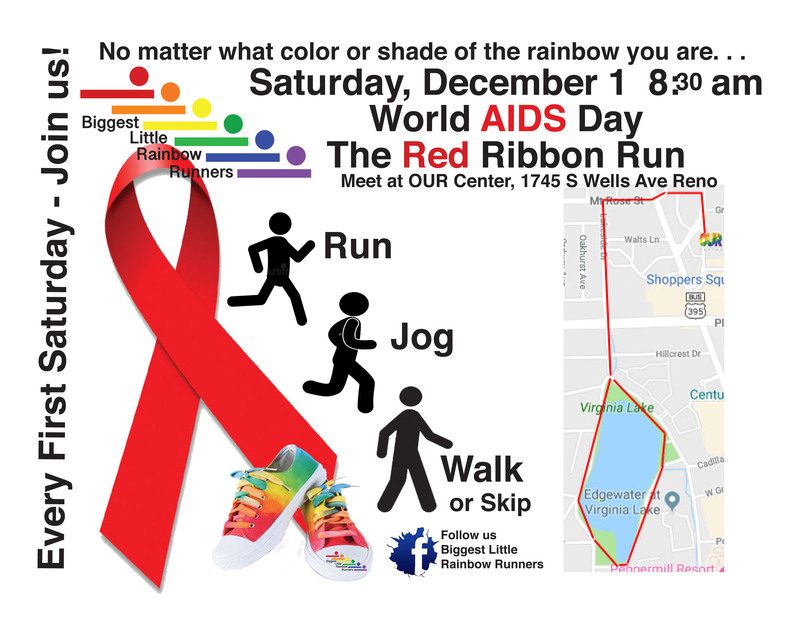 The day starts off with the Biggest Little Rainbow Runners Red Ribbon Run/Walk at 8:30 am starting at OUR Center, 1745 South Wells Ave. The course is about 3 miles from OUR Center up to Vesta, across to Mt. Rose, Lakeside to Virginia Lake (.9 mi. ), looping around the lake (1 mi. ), back up Lakeside to Mt. Rose and back to OUR Center. Biggest Little Rainbow Runners founder Emily Rose Skywalker will be handling out red ribbons to those attending the run/walk. The Photo Voice Project in the rotunda of the Knowledge Center (the Library) at the University of Nevada, Reno (East 15thStreet and West Stadium Way) begins a Noon and runs until 4 pm. The project is a collection of photographs which capture the interaction of HIV/AIDS and other social determinants, such a mental health, substance abuse, health disparities, and stigma. Local area Ryan White Provider Agencies will also be on hand to discuss current Ryan White Programs that are available. 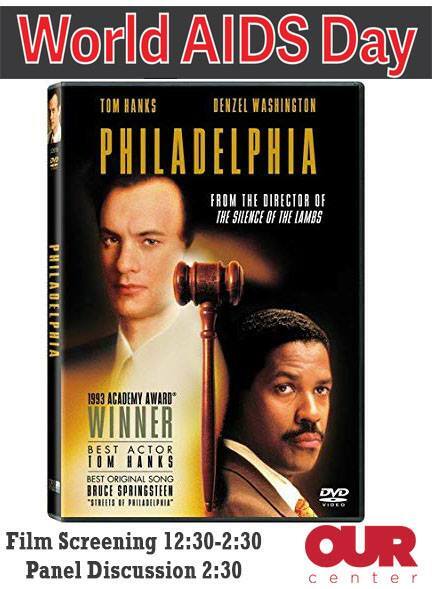 The 1993 film, Philadelphia, starting Tom Hanks as Andrew Beckett, who was fired by the law firm he worked for because of his HIV status, will be screened at OUR Center starting at 12:30pm. Following the screening, a panel discussion on the stigma of HIV/AIDS will be discussed. Latinx Pride New Generation will host a game day following the panel discussion. Games will include Loteria, a traditional Latin version of Bingo for 10 players. Free HIV testing will also be provided at Our Center by Washoe County Health District during the screening and the games. At the Northern Nevada HOPES Clinic, 580 West Fifth, Primp and PrEP will start at 2 pm and run through 6 pm. Attendees will be able to get information about PrEP and PEP, which can help reduce the risk of contracting HIV. To get ready for the activities of the evenings a limited number of coupons from MAC Cosmetics will be available to have your makeup done at their Meadowood or Summit Mall stores (limited supply – distributed on a first come, first serve basis). The 29thAnnual AIDS Benefit Gala, hosted by the Silver Dollar Court, Empress Hope Jewel Halston and Empress Chanel will be held in the historic Sammy’s Showroom at Harrah’s Hotel Casino (Downtown Reno). Doors open at 6 pm and the show begins at 7 pm featuring special guest, Orgina, from season one of RuPaul’s Drag Race. The evening fund raising event features performances by local drag community. 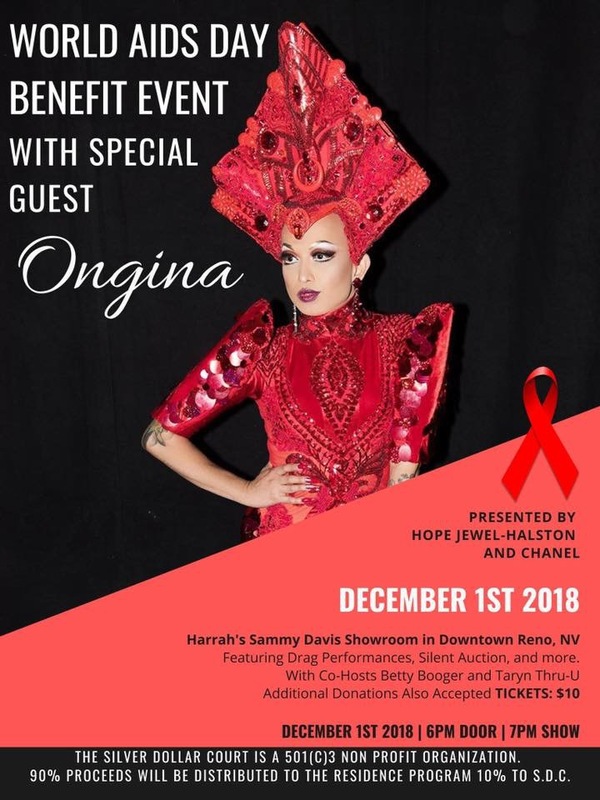 Coming from Sacramento will be Empress Taryn Thru-U and Empress Betty Booger to lend a hand in the event benefitting the Residence Program of Northern Nevada HOPES. There will be a silent auction and raffle at the Gala. Tickets to the event are $10 and will be available at the door. 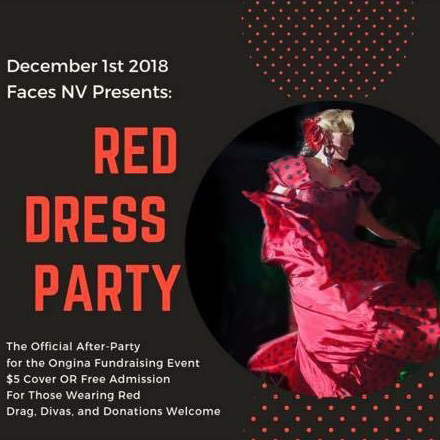 To close the day of activities, FaceNV, 239 West Second Street and Sinful Entertainment will host the Red Dress After Party. The party gets started at 10 pm. All those attending are being asked to wear a red dress no mater your gender or how you identify. Those who attended the AIDS Benefit Gala will be admitted free to the After Party. There is a $5 door charge otherwise. NNOT will be hosting a raffle with a twist. Those attending the various events can get a passport stamped. Passports will be available at all the events except the RedRibbon Run/Walk. Participants must attend at least three events to be entered into the raffle drawing. Among the raffle prizes are: Peg’s Glorified Ham & Eggs gift cards; The Row (Silver Legacy Resort Casino Reno, Eldorado Resort Casino, Circus Circus Reno) Night Out Package; and season tickets to Bruka Theatre Of The Sierra, Inc. and Good Luck Macbeth. NNOT wanted to thank all those who helped coordinate the days activities provided raffle prizes. A special thanks to Harrah’s Reno for hosting the AIDS Benefit and to MAC Cosmetics for their donation and promotion efforts make A Red Tie Affair successful.